Today's Draw: Ten of Flames in the What to Know About a Future Life position from the Margarete Petersen deck and the Deck of 1000 Spreads. What have you cleansed yourself of and purified in this lifetime? What do you think your big lesson has been in this life? And what do you think you'll have to focus on next time around? This is something you don't think about very often, is it? 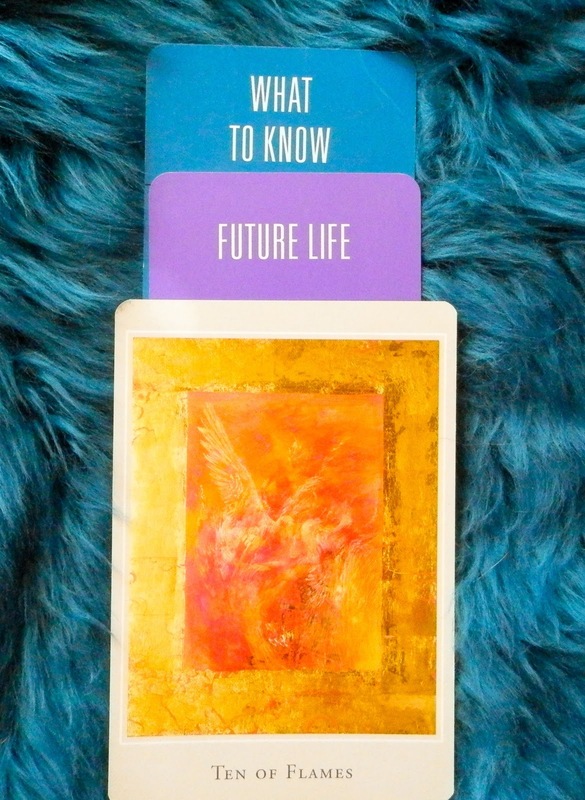 For those of us who believe in past lives and future lives, the general assumption is that you evolve over lifetimes. And so we seek to improve in this lifetime, partly for our this-life benefit, but also for a future life. So it's an interesting thing to noodle...what have you earned absolution from in a future life, because you dealt with it in this life? And that's not to say, "I've earned to live my next life without mean people in it because there have been a lot of mean people in this life." I don't think that's how it works. But what have you HEALED in this life that no longer needs to be revisited? And can we even know? The Ten of Flames is about cleansing and purifying. It's about healing areas of obsession and compulsion...about redeeming ourselves. It's about welcoming situations that once vexed us...not in an "I'll show you" kind of a way, but in a way that genuinely no longer pushes your buttons. When we get to that point of enlightenment about something—a deep understanding of why it's there and gratitude for its presence—we no longer have to face it again. This hasn't been a lifetime for me where I learn a lot about romantic love, for example. I'll probably do that in another life. In this lifetime, I don't have the patience to deal with other peoples' crap on a one-on-one, intimate basis...haha. So I don't sustain those kinds of relationships very long. I have a great respect for that ability and came from a household where I had that kind of commitment modeled for me, but it's not what I'm focused on this life. On the other hand, this *is* a lifetime where I'm learning about the solitary path and the path of the seeker. I'm also learning a great deal about how to take things less personally and how to love and accept myself, but I think I need at least one more life for those last two things. So it's interesting to think about. What do we NOT have to deal with in this life? And is it because we think we've healed it in another life? Or because it's waiting for a future one to take shape? I think we all learn things in a different order. So while I may have yet to learn to pull off what my parents pulled off with their "til death do you part" kind of relationship, you might be having that lesson this time around and have no idea how to be alone. I think I've spent many lifetimes as a lone wolf in that regard, in fact. A reliable source once told me that I had a lifetime where I had, like, a dozen children and had to raise them alone in a cabin in the woods because my partner abandoned us...haha. That would certainly explain my aversion to children and my desire to spend this life with just dogs and the occasional male. So maybe you have some sort of "explanation" like that in your past life as to why you're choosing something unconventional this time around. It's interesting to think about. I once did a past life regression where I saw that I starved to death...again a solitary life. And perhaps that's why I overeat in this lifetime...because of the memory of that life of lack. Who knows? Hopefully this will open up your own thinking in this regard. If we even just consider what we came into this lifetime to heal, it can help us focus on the one or two things that matter, you know? And it can also help us forgive ourselves those areas in which we just really aren't adept....areas we're scheduled to address in a future life.